Chris Cowdrey has been one of the most popular Cricket After Dinner Speakers for over 25 years. Retiring from Cricket at a relatively young age led Cowdrey to find his forte as a guest speaker. Upon leaving Tonbridge School in 1975, Chris went straight into a victorious tour of West Indies as Captain of Young England and a career in Cricket. 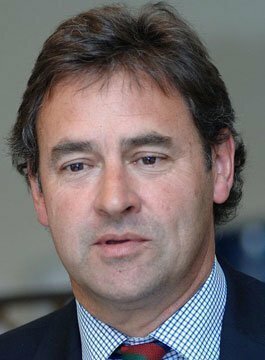 A predictable route for the eldest son of one of the great names of English Cricket – Lord Colin Cowdrey. Chris himself captained England Schools, England Under 19’s, Kent for 6 years and in 1988 was appointed Captain of England against West Indies. Chris’ account of lining up against Viv Richards, has been widely regarded as one of the great after dinner tales. Cowdrey also played all 5 Tests on David Gower’s winning England Tour of India in 1984. One remarkable statistic is that Chris, his father and brother Graham were on the Kent team sheet for 48 consecutive years – an unprecedented record. Chris has written 3 books including two books for children. ‘Freddie Meets Freddie’ in particular is an enchanting children’s story enjoyed also by adults who share Chris’ sense of humour. As a broadcaster, he has worked with Sky TV and Test Match Special and was lead Presenter for 8 overseas England tours with TalkSport alongside Geoffrey Boycott. Chris is an avid supporter of many charities, culminating in his appointment as President of the The Lord’s Taverners. Chris made his name as an entertainer following his sports career speaking at a wide variation of events. His natural humour lends itself to any event whether with a sporting bias or not. Chris has a great understanding of how to run an event with his experience in the business as an MC. With Chris at the helm, your event will have the right blend of humour and the best chance of running to time! His charm will ensure a good atmosphere. Chris has hosted many of the major awards events and is comfortable with auto cue, scripts and interviews. Chris Cowdrey has conducted more than 50 Auctions every year since 2007 when he founded a charity fundraising business. His natural humour and charisma has made him a very popular auctioneer.